It’s the most wonderful time of the year! For us marketers, this means a lot of hustle and bustle; Christmas campaigns, New Year, sale season, wrapping up 2017, and it goes on and on. During this time it’s easy to forget about our own needs, wants, and wishes. It sounds too good to be true, but moving from customer touchpoints to journeys where we are finally able to see the world as customers do and understand the customer experience across channels, not in silo’s, would be a dream come true. Part of that is moving away from cookies onto person-based identifiers so that we can link devices that are used by the same person. To be honest Santa, the only cookies we want on our plate this Christmas are gingerbreads. 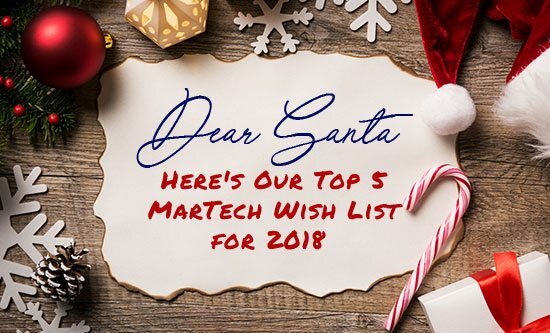 We don’t want to sound greedy, but since we’ve already mentioned online and offline integration…what would really take us to la-la land on top of that is the convergence between Adtech and Martech. Optimising our ad spend while delivering relevant and timely ads at scale is high on our wish list. For us no white Christmas, but rather a single platform that brings all our data together. Where we can easily access, analyse, visualise, and share data across different departments. Along with better data quality, so we can improve our decision making. We know the saying ‘garbage in, garbage out’ to be absolutely true. We all ‘get’ to some extent that AI can help us make better use of our data to increase our effectiveness, but how exactly does it do this? After all, you can’t learn from what you don’t understand. It’s time to open up the Christmas packages and see how AI decisioning is helping us work smarter and not harder. And no, that does not include presenting us with impenetrable algorithms. Key to survival in a constantly changing environment is our ability to adapt. Luckily, with technology getting smarter our lives as marketers are made a whole lot easier. Or is it? There are still a lot of aspects where we are trying to keep up. Customisation for our needs and wants would be incredibly powerful. For starters, dynamic reporting where we are able to customise features as data points, dimensions, and time frames without charging us a la carte for the privilege would be a good start. But most importantly, we want to go back to our roots again and focus on the actual person at the end of our marketing chain who is receiving what we’re sending them. We have to say Santa, with these wishes it’s beginning to look a lot like Christmas. After all, when it comes to the year ahead, all we want is to stay in the game, have an edge on our competition, and a thorough read on our customers. Be a doll, Santa, and help us with our wishlist. After all, we’ve been good this year!